NSW Minister for Planning and Housing, Anthony Roberts, said it was Gosford’s “time to shine” as he unveiled plans for the $10m transformation of Leagues Club Field on Monday, February 25. The waterfront field is set to become a nature-inspired space with water play and sensory experiences for all ages. Releasing the design for community comment, Roberts hailed the concept as yet another watershed moment in the revitalisation of Gosford as the Central Coast capital. Minister Roberts said the concept plan displayed a ground-breaking style of immersive nature play for the community to enjoy, with stunning plans from Turf Design. “These plans are next level. “We are going beyond structured playgrounds with soft fall and slippery slides. “We’re looking at a living, breathing bushland ecosystem that complements the park’s proximity to the waterfront,” he said. Roberts said initial engagement with the community earlier this year had given an understanding of how people wanted to see the 2.4ha of public space used. Consultation will be ongoing with Central Coast Council and stakeholders as detailed design proceeds following the close of the exhibition period on March 15. 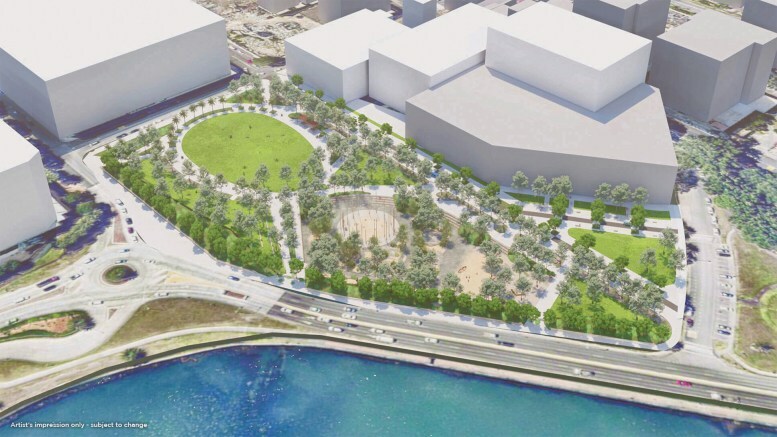 Roberts said he was “thrilled and enormously proud” to unveil the initial plans, which were formulated in conjunction with the Darkinjung Local Aboriginal Land Council so “threads of the aboriginal culture” were woven throughout the parkland. “We are continuing to work with the Darkinjung LALC to ensure that the space is embedded with Indigenous culture, sharing their stories and connection with the region,” he said. Senior landscape architect for Turf Design, Scott Jackson, said the firm had been very excited by the design brief. “We were tasked with making the field a regional destination,” Jackson said. Once the consultation period is complete and community feedback received, Turf Design will refine the design with construction expected to begin late this year.